This is the job I've been working on today. I get a lot of alterations from this lady and most of it would be considered 'funny'...She's lovely, but she doesn't half find me some odd work to do...(and she'd be the first to admit to it. ) She's always delighted with whatever I've done for her...so she's a great customer...but some of the things she's asked me to do, make me feel a bit embarrassed. I think it was Bloobell who said...'part of you will die inside'...when you have to bodge something? That's absolutely spot-on. I know exactly what you mean. Well I've done more of that sort of work for this lady than for anyone else. This coat needed to have about 8 inches adding to the length. Customer helpfully supplied a second coat for me to cut up. The spare coat was a few sizes larger, so I had a bit extra to play with across the width of the pieces I added on. I cut the new pieces at 15 inches deep...just to be sure I'd have enough after levelling everything up...plus...the back of the coat seemed to lift up a bit shorter than the front when the lady tried it on, so I wanted, and needed to have the extra allowance for the back. The pattern's obviously off, and we've got a slightly fluffy line where the pieces have been seamed on. There just isn't that much fabric to play with pattern matching. The length has been safety pinned up for now at roughly the length she wanted. She will return for a fitting and we'll see how it is and if I need to do anything else. 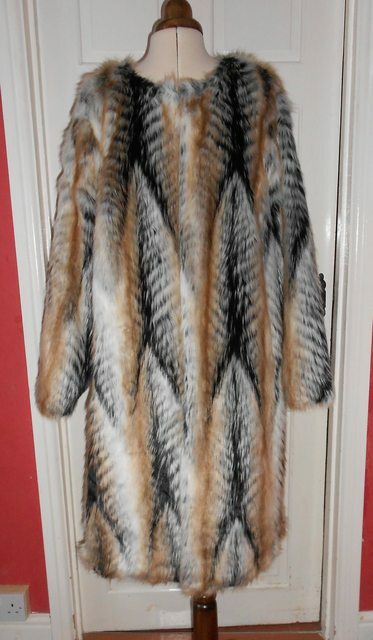 @Sandra I have a gorgeous silver fox coat but the shoulders are stuck in the eighties. I can't bear to part with it but now I know who can fix it.....any chance?!?!?! Since you do 'wee funny ones'! Ahh....unfortunately...(ahem)...you live too far away from me. Did you not think to add the new bit the other way up, to make diamonds ???? That's the quilter talking in you ...it would have looked nicer, but sadly the fur pile would have stroked the wrong way. I`m just wondering what sort of person has a spare fur coat which can be cut up and matches the other one! Catalogue? purchase...maybe sale items and she bought two? @sewingj Dahling surely we all have a spare fur coat or two? I store mine with my collection of diamond necklaces. Sandra, Dear, lovely work on yet another oddball customer request. So, is that real fur or faux? And either way, just what fur is that supposed to be? By the fluff in some places it looks real, but having a second matching coat I'm thinking faux. I spent a lot of time years ago selling fur coats, but never any quite like this. This looks a bit like fox, fully let out, but I've only ever seen red fox in coats and it was long ago. Was tempted to buy one by a stellar long coat we got in but I didn't have the life to go with it. Definitely fake fur, but I've no idea what type it's trying to be. When I first looked at the photo I uploaded, it made me think of a pile of fish but perhaps that's just me? ...When I first looked at the photo I uploaded, it made me think of a pile of fish but perhaps that's just me? Not any more, it isn't!! @Iminei I think that's what the lightsiders call 'a nap'. We darksiders have a whole different concept of nap altogether. I certainly do and it involves a sofa. Our clients do like to test us, don't they? Funnily enough, I'm also working on faux fur. Santa called me in early January and asked me to replace the ermine (faux, thankfully) on his long coat and cape/hood (he's a victorian style Santa) as his velvet had got wet and bled red dye onto the white fur. I'm currently unpicking about 15 linear metres of fur, wheezing and trying to stop the fibres going up my nose. That's a lot of fur to unpick ...and at least you know there's no rush to get this job done. He won't need it until Oct/Nov. "This coat needed to have about 8 inches adding to the length. Customer helpfully supplied a second coat for me to cut up. " Must admit, although I sometimes admire other peoples more exotic taste in colours, patterns and fabrics and the sense of adventure that must go along with this, I'm a bit of a plain Jane with my choices, never want to catch the eye shall we say. Don't think I've worn anything really eye catching since my early twenties and wore a 'Hot Pants Outfit' and even that was all black. I truly can't imagine having one coat like that, never mind two. Now I'm trying to decide if I'm just boring, very old, lacking in style and adventure or can I put it down to lacking in vision?